*Please be aware, there wil be no late seating. Performance begins at 7pm. The most talked-about dance show in New York comes to Philadelphia. 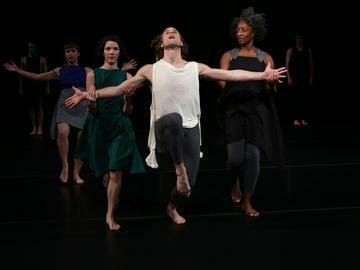 Following its triumphant world premiere at the Brooklyn Academy of Music in December 2013, acclaimed choreographer Tere O’Connor and his eponymous dance company bring the eclectic BLEED to FringeArts’ waterfront stage this spring. The culmination of a two-year project, BLEED collapses three of O’Connor’s dance works into a single hybrid creation, forming an experience that at once conveys multiplicity and singularity. Dancers, ideas, and approaches are blended together to form a new choreographic language at the threshold between process and product, craft and coincidence.